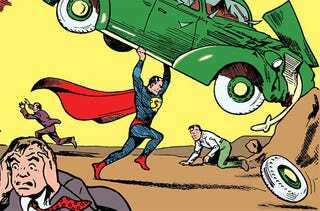 A copy of the first issue of Action Comics, released in June 1938, sold this week at auction for $3,207,852.00. Not bad considering it sold for $0.10 when first released. If you've never seen or heard of this comic before, and are wondering what the fuss would be, it's the one where Superman makes his debut. The comic is valuable not just for its rarity - there aren't many original, unrestored copies of #1 left in the world - but also its condition. Despite never having been sealed in glass or plastic, the issue in question was in remarkable shape (it's pages weren't even yellow), thanks to the fact it was kept in a cedar box in the mountains, co-incidentally achieving the optimal conditions for the preservation of paper. In all, 48 bids were made on the comic. The leap from $0.99 to $1 million sure is something.